As we all know, the smooth performance of a solar PV module is strongly geared to the factor temperature. Higher than standard conditions temperatures can actually mean losses in maximum output power which is why we would usually aim at optimally cooling the modules and this regard the assembled cells. This article is a basic introduction to the temperature coefficient of a solar module, its significance and calculation. Before explaining the measurement of temperature coefficients, we will first look at the definition of temperature coefficient. What is the temperature coefficient of a PV module? Each solar cell technology comes with unique temperature coefficients. These temperature coefficients are important and the temperature of the solar cell has direct influence on the power output of a solar PV module. Once the temperature a solar module operates in increases, the power output of the solar module will decrease. Crystalline solar cells are the main cell technology and usually come with a temperature coefficient of the maximum output power of about -0.5% / degree Celsius. The rated power as generally indicated on the module’s label is measured at 25 degrees Celsius, and with any temperature increase above 25°C you have to take into account power losses of 1% for every 2°C increase. Most installed solar modules in sunny countries easily reach higher temperatures than 25°C. In fact, temperatures of 50°C and above are easily reached. We will take here a solar PV module of Trina Solar as an example, and calculate the power loss when this type of solar module is installed in a region with a hot climate. We pick their currently highest power polycrystalline silicon 60cell module: the 260W. Temperature coefficient of the maximum output power (Pmax ) at STC is -0.41%/°C. Solar module power loss: -16.4% x 260W = 42.64W. The maximum power this module will operate at 65°C is: 217W. Each type of solar cell has its own temperature coefficient. During this measurement, the temperature coefficients of current (α), voltage (β) and peak power (δ) are determined. The resulting coefficients are applicable at the same irradiance level at which the measurement was made. 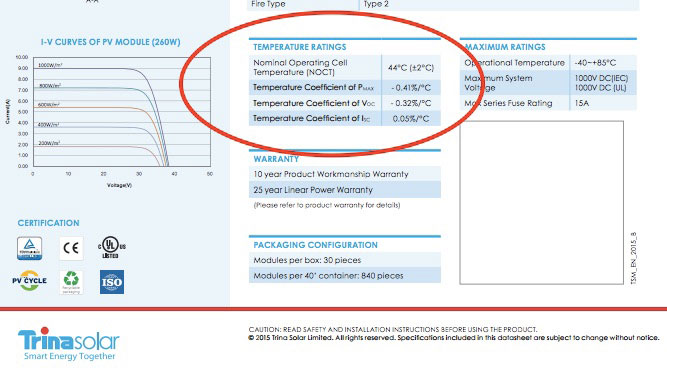 For more material on this subject, the international standard IEC 60904-10:2009 Photovoltaic devices – Part 10: methods of linearity measurement provides for measurement methods related to solar PV module temperature coefficients and different irradiance levels. What about Panels in Cold winter climates with negitive - temperatures? Will there be a power Increase rather than a loss? How would one calculate for - (neg) C winter Temperature Conditions. I'm mainly using this for max voltage produced in very cold conditions to avoid going over my MPPT max incoming voltage specs. The most suitable temperature for solar panels is 25°C，which means temperature above or below 25°C will both cause power loss. You are incorrect. PV modules produce more power when cold. The temperature coefficient is negative for increased temperature, not decreased temperature. I have seen my array produce 125% of its rated power when below freezing. Total rubbish. Don't know where you get this idea, but it is wrong, diddly wrong wrong. Probably too late now, but the fact that a temperature is considered by us (those using celcius) as negative is of no consequence. All that is important for your calculations is the number of degrees away from STC (25°C) so if you are preparing for a cold winter and are expecting minus fifteen degrees celcius then that would be 25+15=40°C so you'd do your calcs with 40xcoeff etc. Itis useful for avoiding exposing the inverter to voltages outside of their safe range. But don't be confused into trying to stay within an inverter's mppt max power range (unless you are using a three axis tracker) as most likely because the sun is so low in the sky during winter, the actual power generated during this low temperature is likely to be far reduced from the theoretical max power of the modules concerned. Plus of course if the panel is well exposed to the sun at this time perfectly perpendicular then it will only be at this extremely high voltage momentarily as it will quickly heat up (unless you are in an arctic wind). Enjoy. a temperature difference of 1K (=1 Kelvin) is the same as 1C (1 Celsius) Only the absulute figures are different. 0 degree Celsius is 273.15 Kelvin and 100 degrees Celsius is 373,15 Kelvin. So a degree difference in both scales give exactly the same outcome.